Ah, the first PPTQ of the season. When hope springs anew, the Colorado metagame is still in its default, Burn-heavy state, and everyone thinks that their preparation was absolutely flawless and that this one is theirs for the taking. Then I usually bomb out of the Top 8, everything goes into wildly overblown flux when some brew runs the tables, and a lot of players saltily grumble their way out the doors. But for that opening bell of the first round it’s a really good and positive experience! Ever since the PPTQ system was introduced I have been grinding away to get to an RPTQ. And just missing. Last Modern season I top-eighted all but four PPTQ’s in the Denver area and lost in the finals four times. I’ve haven’t even come close in Standard and Sealed tournaments. Realistically I wasn’t expecting a different result this time, but at minimum PPTQ reports are content that I don’t have to put any real thought into, so I always make a point of attending as many as I can. Silver linings and all that. This shouldn’t come as a shock to anyone, but I took my usual Merfolk deck to the PPTQ. I’ve been looking very hard at both Eldrazi Taxes and UW Spirits but Taxes hasn’t performed very well for me, and the meta didn’t appear to favor Spirits before the tournament. I was expecting a lot of Burn and GRx aggro and I haven’t come across a Spirits list that can realistically beat Tron or aggro. If the meta was going to be heavily Jeskai and Jund, I would definitely have taken Spirits, optimally tuned or not. I’d played Spell Queller twice in paper prior to the PPTQ, and I was generally impressed. It was better than Vendilion Clique every time I played it, though I did miss the option to just drop Clique in for free information and three damage. Against any contextual spell like Searing Blaze it is an all-star and as a tempo card it is astoundingly good. Quelling Supreme Verdict is just as awesome as you think it is. Combined with Kira it creates no-win card disadvantage scenarios for control and midrange decks. As the report will show, Queller is definitely a Modern-playable card and if your meta looks like the one I hit I would definitely recommend giving the spirit a try. It is, however, extremely weak against Infect, Tron, Zoo, and Primeval Titan. It’s rare that you Quell anything relevant against Tron or Titan, and Infect and Zoo are too fast. Given what I knew about the June meta and the usual Colorado metagame, I came prepared to audible Queller into Harbinger of the Tides if my pre-tournament scouting showed a large number of known Infect and Zoo pilots. Clique is pretty average against all those decks, but Harbinger is very good against Zoo and Infect—since my matchups against Tron and Titan decks are pretty good anyway, I wanted the more powerful card for those specific matchups. I played three Rest in Peace in my board and I’m starting to think that the full four might be necessary. Dredge is a bad matchup and it’s growing in popularity, but it is very beatable if you’re prepared. Rest is also very good elsewhere, which might justify the additional space. I arrived at the tournament site about a half hour early to scout the field and finalize my deck. There really weren’t any test games going on for me to observe, but the advantage of being a dedicated grinder is that you recognize other grinders and learn the kinds of decks they play. As such I didn’t see any known Tron or Infect players in the field, which was a relief. Who I did see were a lot of Jeskai and Burn players, so Spell Queller got the start. 32 players showed up for the tournament, which meant five rounds and that the magic record was 3-1-1. Unfortunately, the venue was a relatively narrow west-facing building (in the middle of summer) that was also filled with a PC gaming bank and a Yu-Gi-Oh! tournament (which I did not know still existed) and the AC was broken. Yeah, it got really hot and muggy really quickly. It was far more comfortable to stand outside in the actual sun. I’m certain that the heat was responsible for a lot of poor play over the course of the day. I start off at table one. Grr, bad sign. As I mentioned in my States report I don’t normally win when I start at a high table. This was going to be especially difficult as the store had set up table one to be a streaming feature match in the back of the place. Where there was no airflow. It quickly got stifling back there. And ultimately for naught as technical problems kept the streaming from ever actually going off. Oh well. I know Everett as another grinder who usually plays slower decks, frequently oddball Gifts Ungiven decks. This could be a good sign since Merfolk is pretty strong against random combo-y decks and I have graveyard hate, but it could also be quite bad if he has something really weird and powerful. I win the play and lead with Wanderwine Hub and Cursecatcher. Everett plays a Scalding Tarn and says go, which tells me nothing. I attack, then play Master of the Pearl Trident to play around removal. Everett just cracks his Tarn for a tapped Hallowed Fountain, then plays Sulfur Falls and says go. Jeskai, probably control. Hmm, oddly mainstream choice for what I’ve seen him play in the past. I attack and Everett flashes in Snapcaster Mage to try and trade with my Master, but I Echoing Truth his Mage. My thinking is that he must be removal-light and I’d rather not trade off creatures if that’s the case. 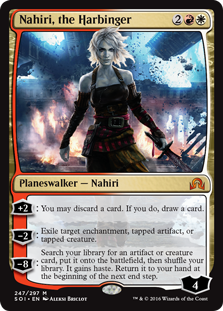 My read is correct, as he just plays a Path and then a pair of Nahiri to slow me down before Kira shuts off his removal. Everett concedes, I think prematurely, to me playing a pair of Silvergill Adepts while at eight life. At most Jeskai plays Snapcaster and Vendilion Clique as creatures and graveyard hate is very good against them, so we take out Path and add in Rests. My opening hand is fine with Aether Vial into Spreading Seas, but I draw lands instead of creatures and just never put any kind of offense together. Everett does end up discarding Emrakul, the Aeons Torn to Nahiri when I have Rest in Peace in play, but he was in complete control and never really needed the “combo” to win. I mulligan into a hand with Vial and creatures so I keep. It takes a while for me to get onto the board, but Everett never sees sweepers and floods as badly as I did in the previous game. I put the game out of reach by Echoing Truthing an Adept in response to Lightning Bolt and eventually play two Master of Waves when Everett goes hellbent to win the game. We quickly pack up and get out of the shop. We were both sweating so badly it was getting hard to hold our cards. I take some comfort in a round one win, but my history of starting at high tables and then bombing tempers any joy I might be feeling. And my pessimism is justified when I see the pairings. David is the Dredge player from my IQ report a few weeks ago and I’m expecting to get crushed. Losing the play doesn’t help matters. He plays Insolent Neonate turn one and dredges Golgari Grave-Troll. Just about as good as it gets. He gets favorable dredges and goes a bit wild with Life from the Loam. I may have still won had I gotten another turn with multiple Vials and a Master of Waves, but he has Rally the Peasants and three Narcomoebas when I’m at nine. Dredge is a fair and balanced mechanic. Well, this is why I tell everyone to play hate, so I guess I’ll bring mine in. I don’t expect to be able to harm his mana very much with Seas and his creatures either block poorly or don’t block at all. I have an Aether Vial and two Rests in my opener and the Wanderwine Hub to play them. David has two Abrupt Decay to try and get free, but I draw my last Rest and he only had the two Decays. I win since his deck doesn’t do anything anymore. As we shuffle up for game three there’s some banter about Dredge’s degeneracy and David mentions that it would be wild for him to keep a hand with three Simian Spirit Guides and three Faithless Lootings but no land. Guess what happens? David draws his hand, stares for a minute, and says he has to keep. I mulligan once to try and find RiP but keep a six because it has Cursecatcher. I think that taking one mulligan to try and find hate cards is fine, but after that the odds drop enough that I don’t think that strategy is viable. It also puts you dead if your opponent can answer the hate. I don’t think it’s worth the risk. Given his reaction, I ask if he has it, to which he responds “Kinda,” and exiles Spirit Guide to play Looting, discarding nonsense, Grave-Troll. He does it again, dredging six for Troll and then two for Dakmor Salvage. He gets a Narcomoeba, plays Salvage to trigger twoBloodghasts, and gets a Prized Amalgam at end of turn. I play Cursecatcher and say go. He dredges Life, pauses, then attacks with everything. I know he has no land at this point so I trade with a Bloodghast. David says go. I play Adept, then trade with the other Ghast after David tries drawing a card like the rest of us. Still no land. I play Kira and eat his ‘moeba. Still no land. Finally in the clear at five life I play out lords, trade for the Amalgam and beat him down. He finally gets a Ghost Quarter which turns Salvage into Mountain so he can use Burning Inquiry, but he admits that he doesn’t have an actual out since all the good creatures he could potentially muster won’t be able to block. Variance won me that game. Had he drawn a red source David would have Inquiried himself through most of his deck and just crushed me. Those are just the breaks with a degenerate deck; you will always be as much a risk to yourself as your opponent. I get done pretty fast and flee outside once again. While chatting with colleagues, one of the Yu-Gi-Oh! 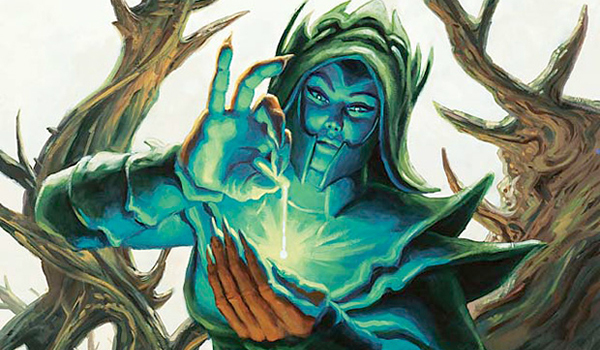 players comes up and asks if the Modern metagame is aggro- or control-focused. When he hears that Colorado’s metagame is Burn heavy, he nods and says that it’s the same way for them (…they have burn cards? ), and apparently out of state players will pre-board against Burn when they come here (there’s a Yu-Gi-Oh! circuit?). I guess there’s just something about this state that makes us want to watch the world burn. Speaking of, I know that Paul is an aggro player and often packs Zoo. I’m not looking forward to this match, especially when he wins the play. Still, if I win this I should be lock for Top 8 as long as I get a draw. This is the most pleasant match of the day for me since I’m at table four which is right in front of the door and the fans. We both mulligan and Paul leads with Goblin Guide, who gives me lands every time he attacks this game. I have Vial to start and Paul misses a land drop, just playing Experiment One. I think I’m pulling ahead with Adept when Paul plays finds a land and plays Burning-Tree Emissary and Reckless Bushwacker and attacks. I trade my Adept for the Experiment and drop to eight. Fortunately Paul continues to stall on mana and I am able to recover, trading creatures off until I get Kira into Master of Waves and win at three life. Seas is just too slow in this matchup since by the time I could deploy it Paul should have built a pretty good board, which should make Hibernation amazing. I still want a few in to islandwalk through a stalled board. I mulligan into a six that has a Path and white source. Paul doesn’t have a one-drop, and this lack of speed costs him the match. I win at thirteen life, having used several Paths to break up attacks and trading my creatures for his. Eventually the board stalls between a Ghor-Clan Rampager and a Tarmogoyf on his side, and Kira plus Master of Waves and Adept on mine. My tokens keep him from attacking and a Seas shuts off one of his two white sources so he cannot Path Master through Kira. Kira beats him from 17 to 8 life before I find a lord to finally swing for the win. Paul got my opening Aether Vial with Destructive Revelry but admitted to only bringing in the one and wished he had saved it for my Seas. This ends up being important later. Standings are posted before round four. There are only four undefeated players at this point. We do the math and we can all comfortably draw the next two rounds and make it in, and do so. I have some incentive to play round five for the seeding, but my opponent is vulnerable if he loses so I agree to draw and we all flee the premises to find air conditioning. I have to give the judge at the tournament props at this point. He showed up an hour and a half before the rest of us in all black. Not sure how he survived in his official judge attire when the rest of us were broiling in the afternoon heat. I end up in third place when all is said and done. It’s a clean break of two 12-pointers, four 11’s, and two 10’s. I forgot to write down everyone’s deck, but I know that besides me there was a Burn deck, Affinity, Paul the Gruul player, and my Quarterfinal opponent. It turns out that sometime during round four the AC was fixed and between that and players dropping, the temperature is getting more tolerable at this point. Steve and I were paired round four and drew, which has apparently come back to haunt me. I know Steve to be a control player, so I’m very confused when he plays life and Gitaxian Probes me. In turns out he’s on the Pyromancer Ascension/Thing in the Ice deck, which is unfortunate for me because by playing the first few turns like he was a control deck I give him far too much time to sculpt his hand and eventually activate his Ascension. At this point I’ve got him to five, and he’s used up all his Lighning Helix‘s, one Bolt, and two Things, and I have a solid board with Queller in hand. He flashes back Faithless Looting, putting the final counter on his Ascension and setting himself up to go off. My understanding, which Steve shares, is that if a flashbacked spell would leave the stack from anywhere there is a replacement effect that exiles it instead, meaning that Queller is just like Remand in this situation. I play Queller. We are both very surprised when the judge informs us that is not how it works and that the exile clause on Queller fulfills the requirement of flashback and the Looting does go under Queller and if Queller dies it acts just like it was never flashed back. He confirms the ruling and I simply state, “Well, now I get wrecked.” Steve agrees, Bolts the Queller and takes about fifteen minutes to draw all but seven cards in his deck, flip a Thing, and then stop going off because he’s afraid of decking. I point out that if this were normal Storm it would be over already because he would have actually won or I would have scooped since he wouldn’t fizzle with several active Ascensions. As is it takes him a few turns to actually kill me since he didn’t have Bolt in hand at the end. I think a lot about bringing in Meddling Mage, but he has enough removal that I don’t think it will work and I can’t take out any more Paths due to Thing. Much like Storm, RiP should wreck him. I keep a hand with a lot of three-drops, Cursecatcher, Vial, and Deprive. Steve Probes me and sees Deprive. Immediately thereafter I draw RiP, and while part of me wants to just slam it down, I figure that he’s planning to bait my Deprive next turn so I just play my land and pass. Steve obliges me with Thing in the Ice, intended as bait to protect the Ascensions he reveals after the fact that he’s holding. I dutifully counter and then slam down RiP and Steve looks very sad. It takes me a while to kill him since I don’t have many creatures and he has many Helix’s but without a graveyard he runs out of gas and dies. I mulligan and keep a hand with Vial and Rest in Peace, which I resolve. Steve plays a surprise Blood Moon afterward and I’m down to one Island. Fortunately he has no followup and I stick a Kira and eventually a Master of Waves. A flipped Thing buys him some breathing room, but I just rebuild and he’s struggling to find playable spells, using Manamorphose to get the white mana he needs for Helix at one point. However I just keep chipping away and he dies with one counter left on a second thing and a white spell in hand. Blood Moon hurt me and slowed me down considerably but I think Steve was hurt far more in the end. I’m the last result, and take a break before the next round to calm down and get my head back together. I figure that this is the end for me. Greg is on Affinity and he is good with it. I don’t like my prospects. Being on the play is my only saving grace. I open with Vial, then a Cursecatcher and Seas for Blinkmoth Nexus. Steve has a hemorrhage of artifacts with the relevant ones being Arcbound Ravager and Etched Champion. I play Lord of Atlantis and Master of the Pearl Trident with another Cursecatcher and hit for six. He plays out his hand, ending in Master of Etherium, but only attacks for three with Champion. I attack for eight and then drop Master of Waves for seven tokens. Greg needs to hit Cranial Plating to get close to lethal and he doesn’t hit. I don’t think I won that game; I think Greg lost by not being aggressive enough with Ravager pumping his Champion. I had a Mutavault to block once but by taking a more conservative line he ensured that I didn’t have to be careful with my mana and I won the race when I don’t think I’m supposed to in that situation. Standard Affinity strategy. Very glad that I overprepare for this matchup. I mulligan a very slow hand and keep one with Recall. He has no haymaker cards, just Etched Champions, and comes out slowly with Vault Skirge as his only turn one play. When he taps out for his second Champion I pull the trigger on Recall end of turn, which also kills his Glimmervoid. I then draw and play Stony Silence and the game is over. In Greg’s words, sometimes it’s just your day. Huh. I wasn’t expecting that. Maybe it really is my day. We’re done well before the other match which turns out to be Burn vs. my Gruul opponent from earlier. Gruul wins thanks to bigger creatures, so the finals will be a rematch, only now I’m on the play. My opening hand has a Vial and two Spreading Seas. If I was on the draw or without the Vial this would be a mulligan since playing Seas keeps me from developing the relevant part of my board in the face of his aggression. As is it works out perfectly and he has only one usable land this game and Vial lets me stabilize while shutting down his lands. It was lucky for me it worked this way, as afterward Paul showed me an absolutely stacked hand that needed two colored sources to be good. I use Queller to further slow him down by taking creatures and then eating removal that would have been better used elsewhere. Sometimes it’s just your day. The same strategy as before, just with one less Revelry target and an extra bit of protection for my Master of Waves. Paul mulligans and thinks for a while before keeping, but keeps his scry very quickly. This tells me he has a speculative hand that is about to pan out. He goes Mountain, go. I just play a Seachrome Coast and say go. Paul bolts in a Temple Garden and plays Wild Nacatl. Huh. No really broken turn two. I (correctly, as Paul admits afterward) guess that he has a hand stacked with removal but no other creatures. I have a Master of Waves that I know will win me the game, I just have to draw out his Path to Exiles. I proceed to slowly trade creatures for removal and three-damage chunks until I play a Master of the Pearl Trident with two Mutavaults in play. He Paths my Master when I block his Nacatl with Vault, I Path his Nacatl in response and he plays Ghor-Clan Rampagerwhich I Spell Queller. He Paths the Queller when I attack and then I play Cursecatcher and Master with another Queller in hand. Paul fails to draw anything relevant and concedes. Victory! Finally winning after so many fruitless grinding seasons is incredibly cathartic and joyous. It’s also a bit frustrating because I qualified for the first RPTQ in over a year that isn’t being held down the street from where I live. You ever get the feeling that the universe is trolling you? I realize that most of you probably have to travel for yours all the time, but I didn’t until just now. And I hate poor timing. It’s also slightly annoying from a writing standpoint because I was planning on doing a whole series of articles on the adjustments and metagaming that go into a qualifier season held up against my tournament results. Having won the very first tournament, that really isn’t possible anymore. So join me next week when I have to change gears and actually come up with an idea for my article. See you in the comments! Atta boy, David! Congratulations on the result. Like you, I’m pretty puzzled by that Spell Queller vs. flashback spell ruling, but I don’t know enough about that particular interaction to opine on whether the rules were interpreted correctly or not. I am a tad surprised you sided out Seas in the Dredge matchup, though. RiP obviously needs to be brought in, but is Seas really the card to cut? I’ve had some success with denying them G for Life from the Loam or double R for Conflagrate. Obviously, the latter’s a bit more difficult against an opponent rocking Simian Spirit Guides, but overall I still think I would want them in. Thanks! I intend to check the ruling with Judge of Judges Scott Marshall at next opportunity. Part of the reason I cut Seas is that in my deck I don’t have much to cut for Dredge and part is that by the time I could reliably cut off their mana they’ve probably done whatever it is they’re going to do. The cantrip is nice, but I don’t think I can cut Vials, removal or creatures for RiP. Wow, I live in Colorado and I wish I would have known about this. Is there a list of PPTQ tourneys? Which store was hosting this one? As someone who has, t this point, some experience (and I daresay success) with spell queller in modern, would you mind me asking a few questions about the card before I sleeve some up? I’m running a DnT shell with all the goodies that brings if you think that matters. I noted that you are only running 2 spell quellers, I had attributed this to merfolk having limited flex slots and queller not being a fish itself, but is that actually the reason? I’m looking at running 3 or 4 of them and if they’re bad at those counts I’d like to know. you mention queller being good against some of the format’s slower decks, and it as being bad against some of the faster linear decks, but you didn’t mention how well queller was performing against midrange decks. I feel less than enthusiastic about playing queller if it makes me softer to jund and abzan. that covers everything that immediately comes to mind (that you’d be able to answer at least). Thanks for any advice and ‘grats on the victory! Not a problem, happy to answer your questions. 1) Fish only has room for two Quellers. It’s at the top of the curve and competes with Merrow Reejerey and Kira, who are must includes, so even if we had a few more flex slots available (my list does not) I’d stick with two. A deck with a higher land count or less competition could and probably should run 3-4. 2) Queller is at its best dealing with spells that are contextually good, like Searing Blaze or Engineered Explosives, where the spell loses track of something important when if it gets played for free. After that, win the game cards like Past in Flames or Scapeshift are also great targets. Removal is tricky, sweepers are obviously great targets but you’re always at risk for getting blown out inconveniently. I never tested against Abzan, but for Jund you have to adjust how you play the card. It will normally be the last card out of your hand and used to answer the last card out of Jund’s hand, putting you in position to win the topdeck war and try to race. It’s been better for me in this matchup than Vendilion Clique was. On the spirits note I have been working very hard to make it work. I’ve found some success by being ‘fair’ with them. Notably Hokori, dust drinker and windborn muse in the main. Removal is basically turned off completely. Path and vapor snag go a very long way to the Aggro matchup. Awesome results! Since you’re on UW Merfolk have you ever tested Ghostly Prison in the side?